Come AT LEAST 10 minutes early. I like to show up 15 minutes before I am supposed to be there. Punctuality was a skill I struggled with in the past, so I have to make a big deal about it to go against that unfortunate flaw of mine! Wear something professional, conservative, and appropriate for the occasion, BUT don’t forget to show a little bit of your personal style! 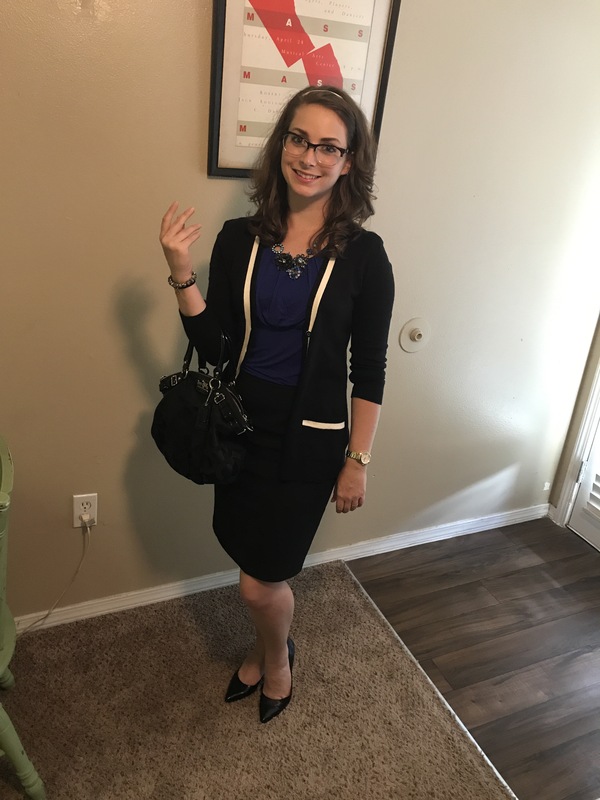 (My first day outfit picture is down below!) Also, even in summer, cardigans are a good idea to combat the chilly AC blast in most buildings! Personal hygiene is a must! Make sure you are clean, and makeup and perfume shouldn’t be too overpowering! 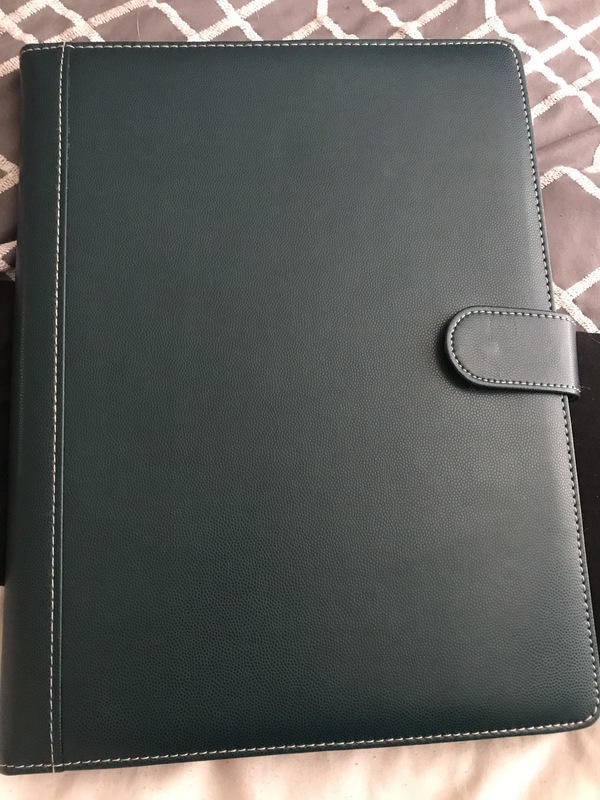 Bring something to take notes with! 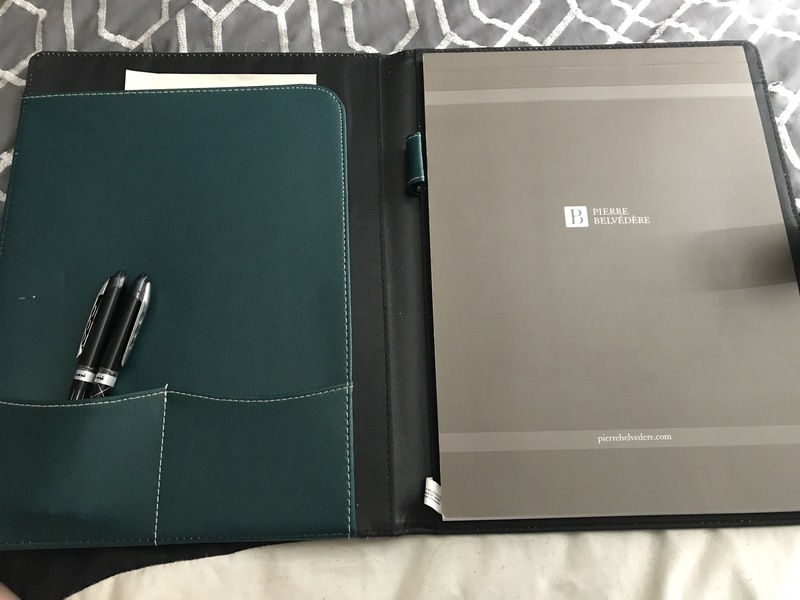 I use a lovely leather Pierre Belvédère mini portfolio with a built in notepad, and I always stick two pens in, just in case one dies. Read and reread your emails so that you bring everything that is required for that first day. Keep a friendly and professional attitude! Ask questions and show that you are willing to put in the work! Try to learn names as early as possible. It helps me to use people’s names a few times in conversation to make it stick. Above is the outfit I chose. Working in education gives me a bit more freedom, but I kept it pretty professional with a slight personal touch! Blouse: Actually a WalMart find from high school! This is how I take notes! There are several more things I could talk about, but those tips always help me make a good impression in a new environment. Comment with your favorite ways to “bring it” and make a fabulous first impression! Good luck with any new jobs or classes this fall! those are excellent tips for your first impression. and many people forget that having a professional appearance includes your note-taking devices and anything extra you carry along (bags, water bottles, etc.). but it’s evident you didn’t neglect to keep that in mind. I hope your teaching job goes well.